The Serial Podcast, Transcripts: The 2:36 Best Buy Call Was in the Opening Statement at the 1st Trial! After listening to the ninth episode of Serial, however, I saw a potential problem with Adnan's IAC claim. Asia McClain is important as an alibi witness primarily because the prosecution claimed that Adnan called his friend Jay at 2:36 P.M. and told him he had killed Hae at Best Buy. The ninth episode made it seem as if the prosecutor didn't make this claim until his closing argument at Adnan's second trial. If this happened, it would have complicated Adnan's IAC claim because Jay actually testified that the Best Buy call was between 3:40 and 3:50ish. Therefore, an argument could have been made that defense counsel didn't have reason to contact McClain before the prosecutor's closing argument at the second trial. The cited portion of the prosecutor's opening statement at Adnan's first trial now lays that argument to rest. Rabia's document indicates that the prosecutor said on December 10, 1999 that the Best Buy call was made at "about 2:30, 2:40." Consider my timeline of Adnan's case: Adnan's defense counsel then had 5 days to contact McClain before the first trial ended in a mistral on December 15, 1999. 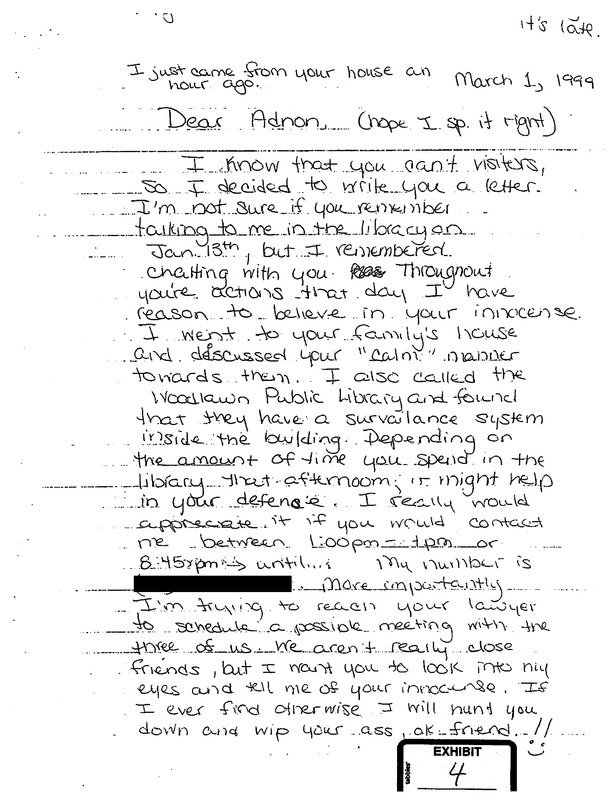 She then had over a month to contact McClain before Adnan's second trial started on January 21, 2000. And she then had another month or so to contact McClain before the defense rested (a verdict was reached on February 25, 2000). This greatly strengthens Adnan's claim that he received the ineffective assistance of counsel.